Download "Agile Software Engineering Practice to Improve Project Success"
3 Why Requirements are Important The hardest single part of building a system is deciding what do build. (B.W. 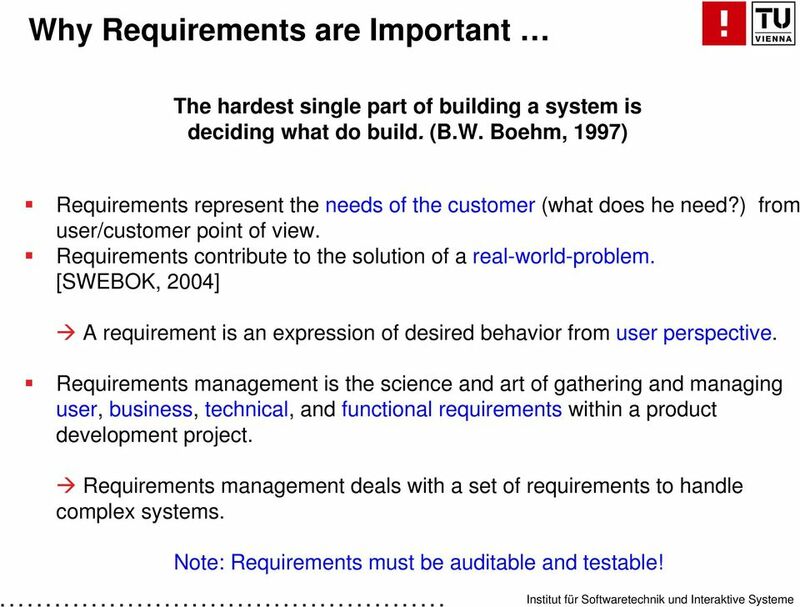 Boehm, 1997) Requirements represent the needs of the customer (what does he need?) from user/customer point of view. Requirements contribute to the solution of a real-world-problem. [SWEBOK, 2004] A requirement is an expression of desired behavior from user perspective. Requirements management is the science and art of gathering and managing user, business, technical, and functional requirements within a product development project. Requirements management deals with a set of requirements to handle complex systems. Note: Requirements must be auditable and testable! 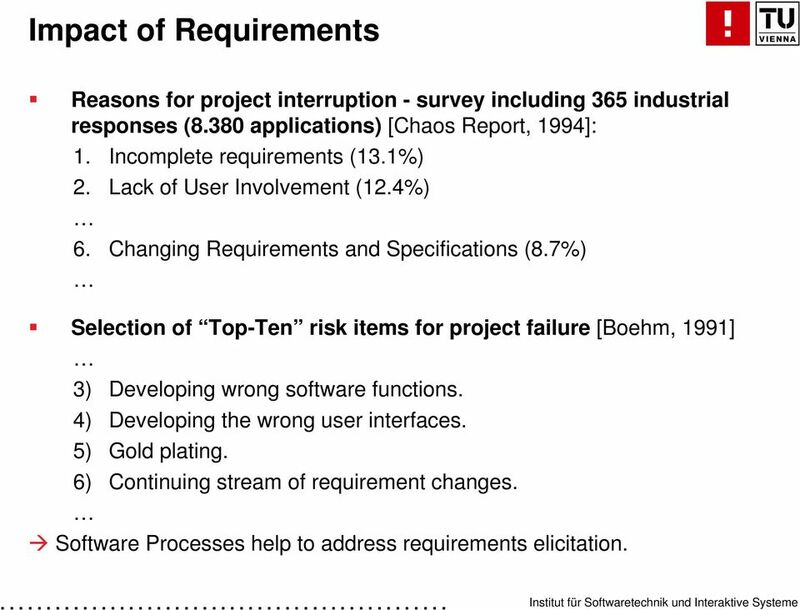 4 Impact of Requirements Reasons for project interruption - survey including 365 industrial responses (8.380 applications) [Chaos Report, 1994]: 1. Incomplete requirements (13.1%) 2. Lack of User Involvement (12.4%) 6. Changing Requirements and Specifications (8.7%) Selection of Top-Ten risk items for project failure [Boehm, 1991] 3) Developing wrong software functions. 4) Developing the wrong user interfaces. 5) Gold plating. 6) Continuing stream of requirement changes. Software Processes help to address requirements elicitation. 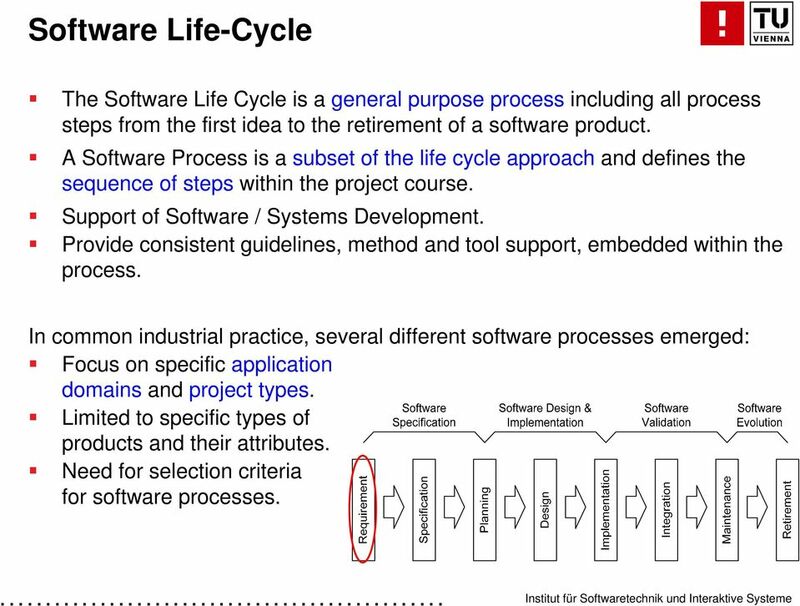 5 Software Life-Cycle The Software Life Cycle is a general purpose process including all process steps from the first idea to the retirement of a software product. 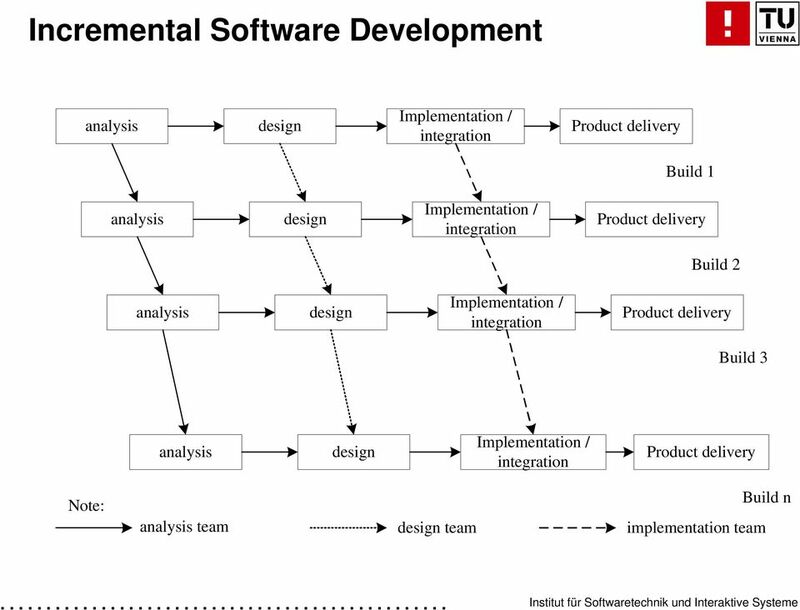 A Software Process is a subset of the life cycle approach and defines the sequence of steps within the project course. Support of Software / Systems Development. Provide consistent guidelines, method and tool support, embedded within the process. 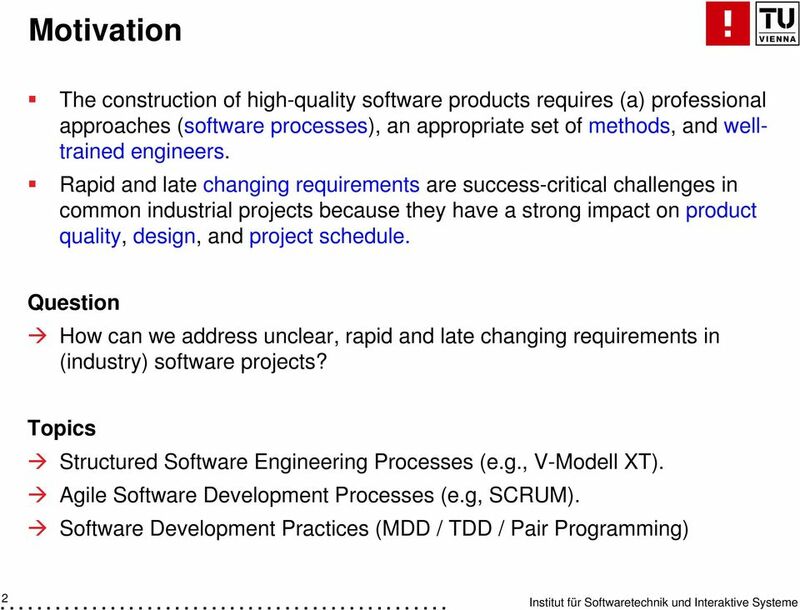 In common industrial practice, several different software processes emerged: Focus on specific application domains and project types. Limited to specific types of products and their attributes. Need for selection criteria for software processes. 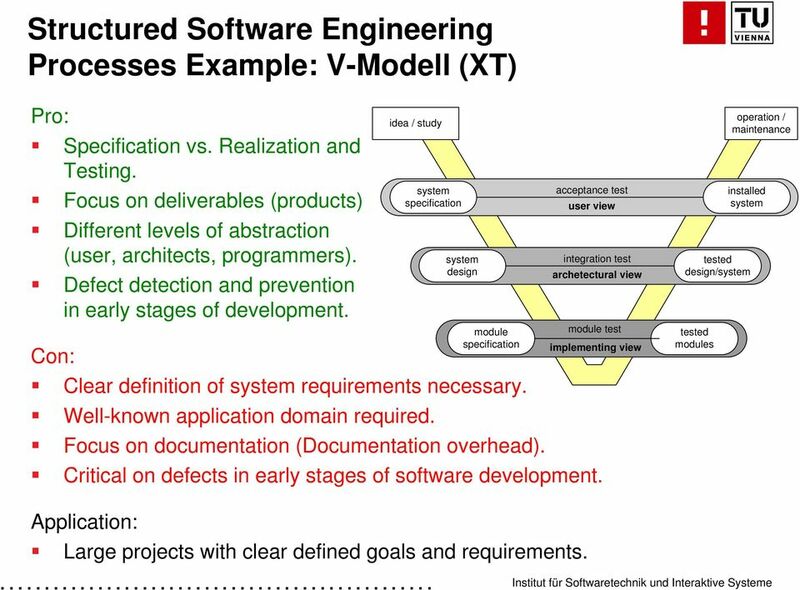 6 Structured Software Engineering Processes Example: V-Modell (XT) Pro: Specification vs. Realization and Testing. Focus on deliverables (products) Different levels of abstraction (user, architects, programmers). Defect detection and prevention in early stages of development. 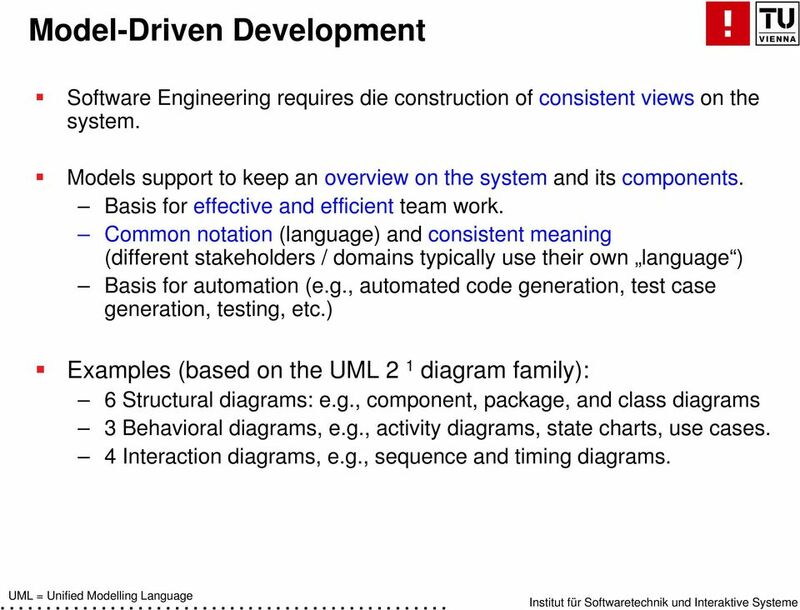 idea / study system specification system design module specification acceptance test user view integration test archetectural view module test Con: Clear definition of system requirements necessary. Well-known application domain required. Focus on documentation (Documentation overhead). Critical on defects in early stages of software development. implementing view tested design/system tested modules operation / maintenance installed system Application: Large projects with clear defined goals and requirements. 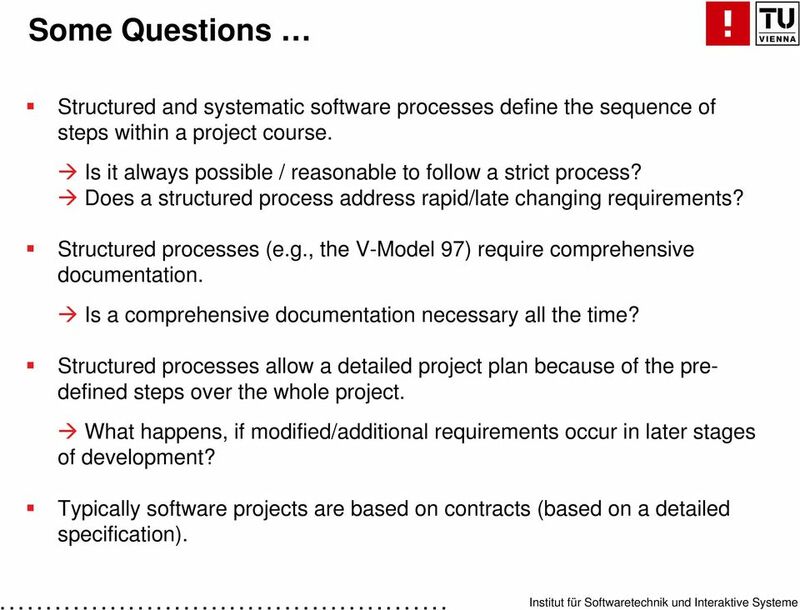 9 Some Questions Structured and systematic software processes define the sequence of steps within a project course. Is it always possible / reasonable to follow a strict process? Does a structured process address rapid/late changing requirements? 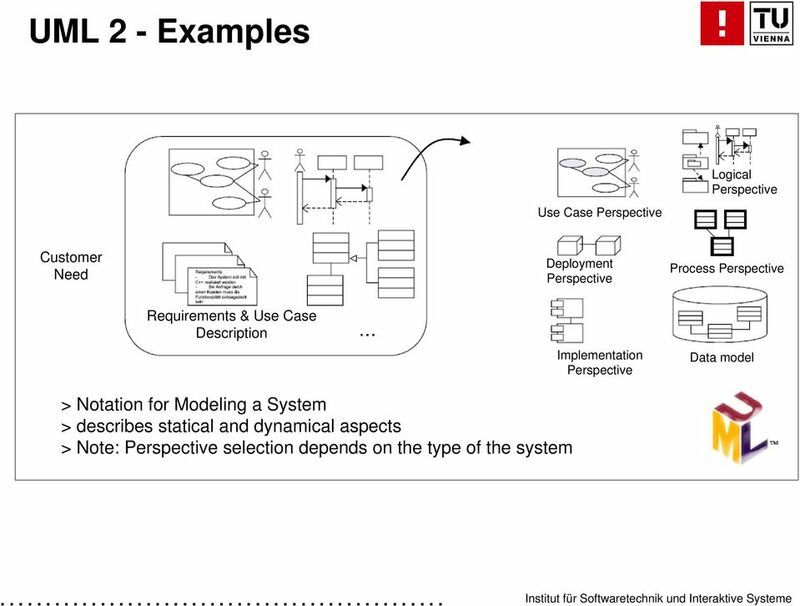 Structured processes (e.g., the V-Model 97) require comprehensive documentation. Is a comprehensive documentation necessary all the time? Structured processes allow a detailed project plan because of the predefined steps over the whole project. What happens, if modified/additional requirements occur in later stages of development? Typically software projects are based on contracts (based on a detailed specification). 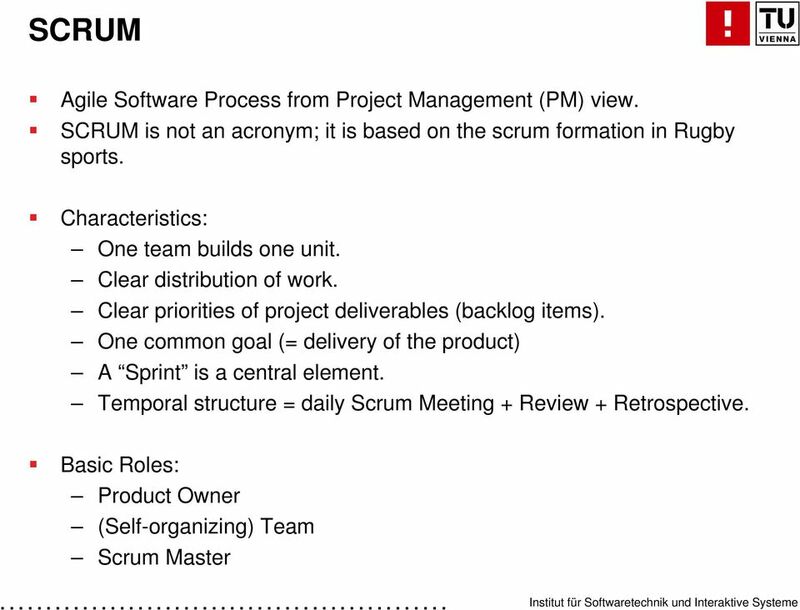 13 SCRUM Sprints Scrum represents a set of procedures, roles and methods for project management. Agile software development Self-organizing teams. 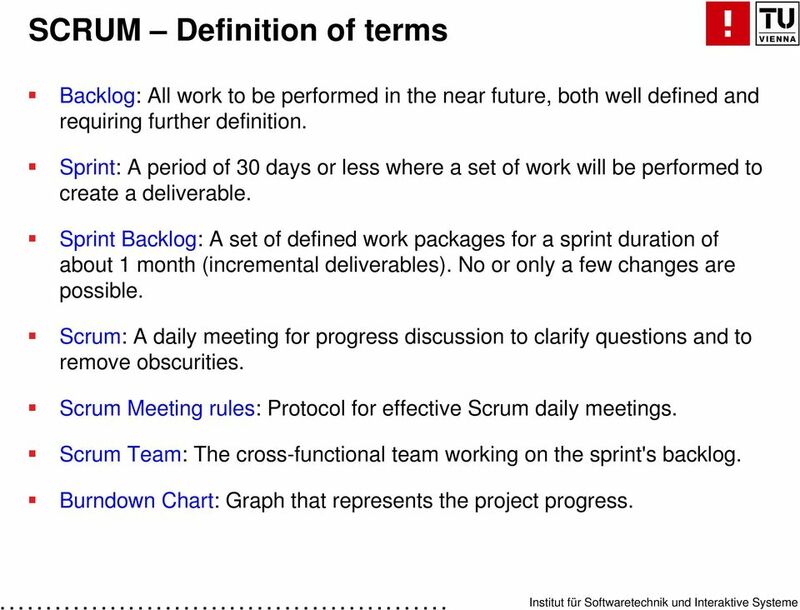 14 SCRUM Definition of terms Backlog: All work to be performed in the near future, both well defined and requiring further definition. Sprint: A period of 30 days or less where a set of work will be performed to create a deliverable. Sprint Backlog: A set of defined work packages for a sprint duration of about 1 month (incremental deliverables). No or only a few changes are possible. 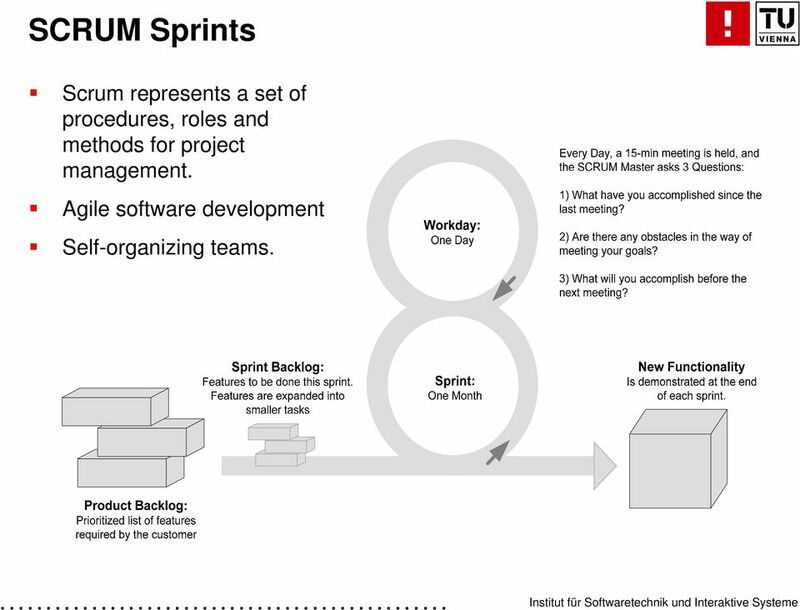 Scrum: A daily meeting for progress discussion to clarify questions and to remove obscurities. Scrum Meeting rules: Protocol for effective Scrum daily meetings. Scrum Team: The cross-functional team working on the sprint's backlog. Burndown Chart: Graph that represents the project progress. 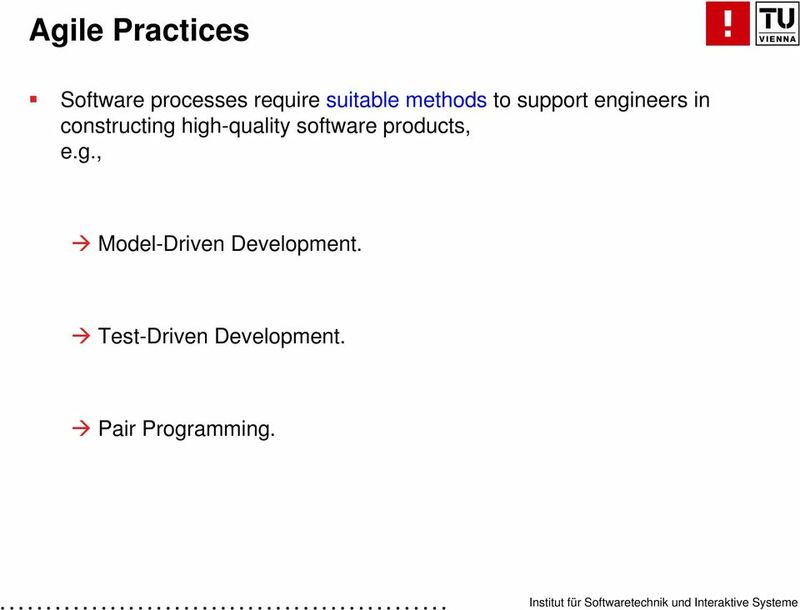 15 Agile Practices Software processes require suitable methods to support engineers in constructing high-quality software products, e.g., Model-Driven Development. Test-Driven Development. Pair Programming. 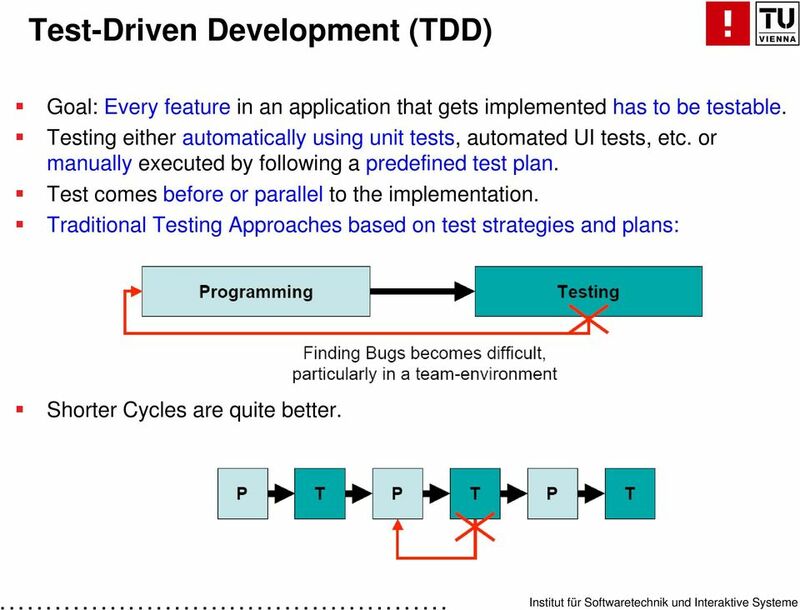 19 Test-Driven Development (TDD) Goal: Every feature in an application that gets implemented has to be testable. Testing either automatically using unit tests, automated UI tests, etc. or manually executed by following a predefined test plan. Test comes before or parallel to the implementation. Traditional Testing Approaches based on test strategies and plans: Shorter Cycles are quite better. 22 Pair Programming Pair Programming (PP) is a common practice in the area of agile software engineering. PP focuses on the construction of software code. PP involves two engineers ( Power of Two Brains ). Typical Roles and tasks Driver: responsible for code implementation. Observer: supports the driver by observing his activities. keeper of the focus and the pace of the current tasks. performs implicit quality assurance activities (e.g., continuous reviews) The role assignment (driver and observer) should change frequently. 24 Next Steps in Pair Programming 1? Pair X : Enhancing Pair Programming. Application of Pairs to other software engineering activities, e.g., Pair Requirements Analysis, Pair Design, Pair Testing Will the involvement of two persons increase productivity and quality in these areas? Are pair activities facilitators for learning, training and mentoring of juniors? Empirical studies will provide answers to this question. IPP: Integrated Pair Programming Extending Pair Programming with systematic Quality Assurance to enable repeatable, traceable and auditable software products required by several application domains e.g., security and safety-critical systems. Currently, the deliverables of the observer are unclear. Systematic QA (e.g., inspection) enable traceable, repeatable, and auditable software products. The integration of constructive and analyitical method might bring up benefits of different disciplines. 1 Ongoing / planned projects at TUW. 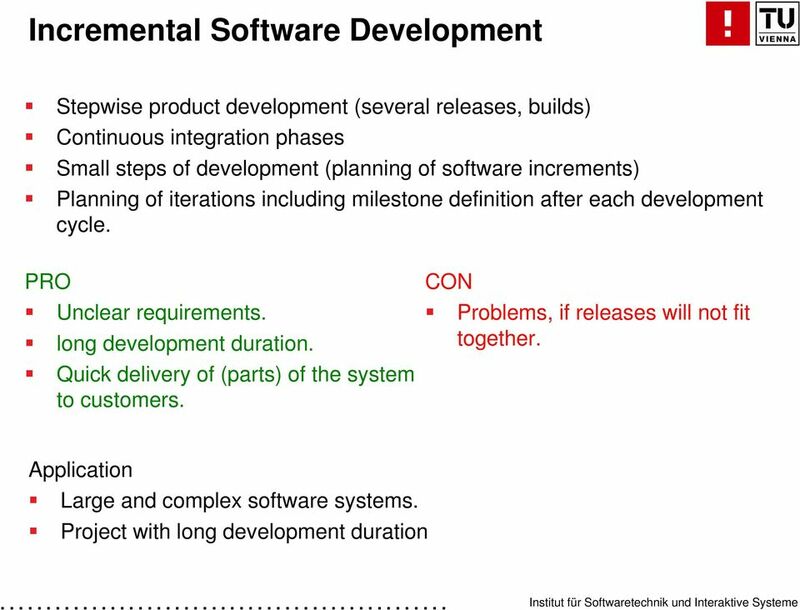 25 Summary Software Processes: Requirements are success-critical in software engineering projects. Structured software processes typically require stable requirements because of a sequential order of process steps with limitations of process backtracking. Agile approaches focus on a tight customer involvement, small iterations and support frequent changing requirements. 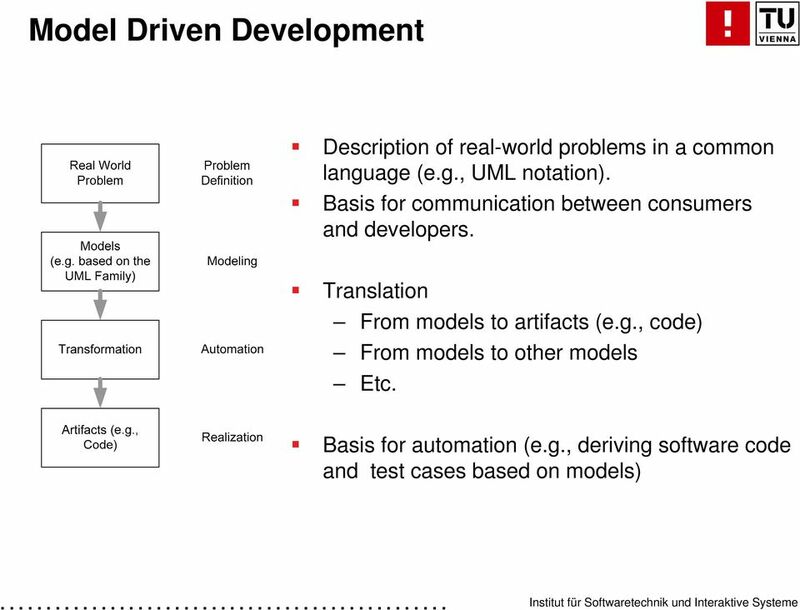 Agile Practices: Models present real-world scenarios, support communication between consumers and developers (common language), and are the basis for automation (e.g., automated code generation based on models). 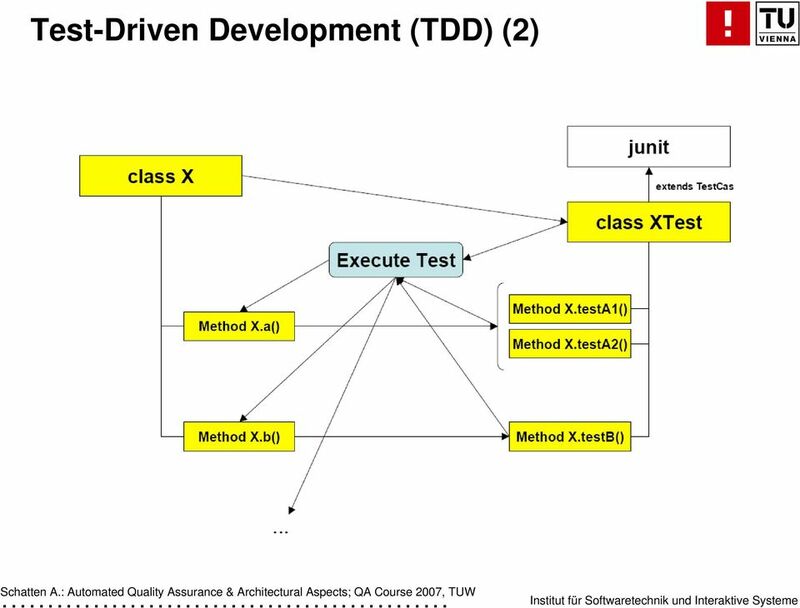 Test-Driven Development (TDD) focuses on the generation of test cases before or (at least) in parallel to the development of software code. Pair Programming is a team activity - involving two persons - to increase productivity and software quality and supports learning. The application of agile software development processes and practices promises to support the construction of high-quality software products with respect to frequent changing requirements. 28 This research work has been supported by a Marie Curie Transfer of Knowledge Fellowship of the European Community's 6th Framework Programme under the contract MTKD-CT : CzechVMXT. 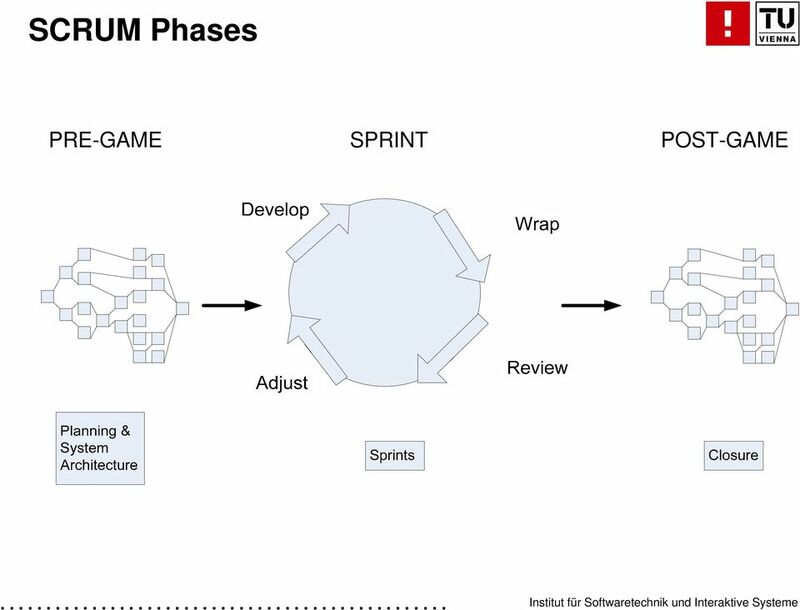 Scrum: A disciplined approach to product quality and project success. 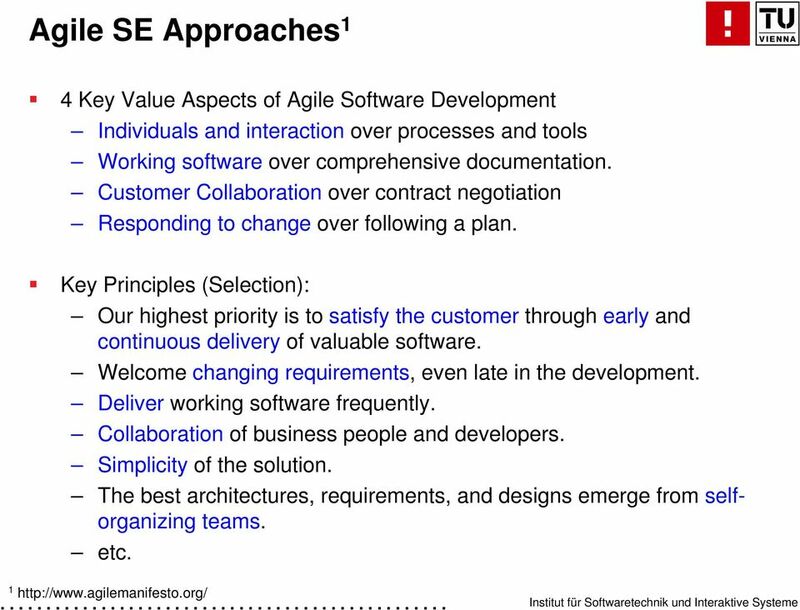 Agile Systems Engineering: What is it and What Have We Learned? Testing in Agile methodologies easier or more difficult? 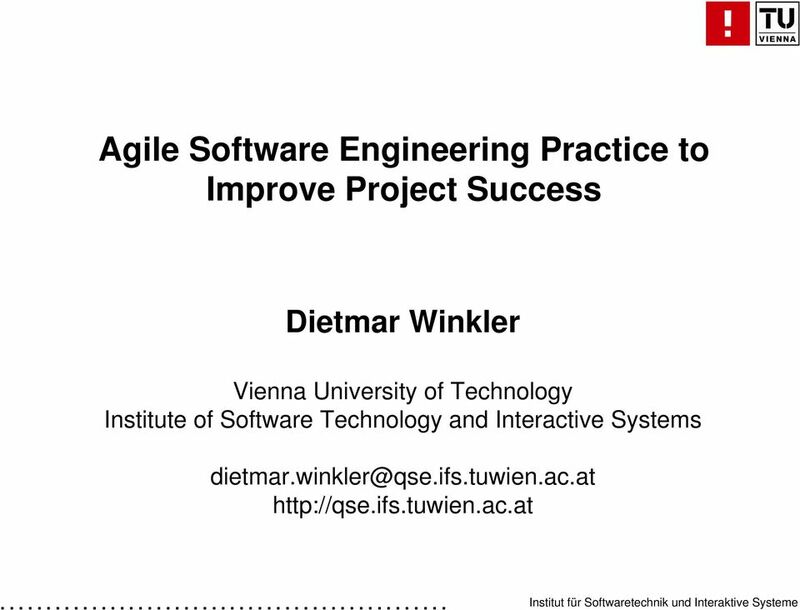 Agile Methodologies XP and Scrum Introduction into Software Engineering Lecture 22 Bernd Bruegge Applied Software Engineering Technische Universitaet Muenchen 1 Problem: How to we Control Software Development?